Abstract art deals primarily with ideas in its subject matter. In its form, it is usually removed from realism, and does not try to represent the physical world in a common sense way. Many people find abstract art inaccessible because it often has no recognizable forms in it. The organizing principle of composition becomes the primary way through which meaning is made in abstract art, dealing with the impact of things like balance, direction, contrast and symmetry. Abstract art is characterized by a reduction to the elements of art; for example, color, line, shape and form. Abstract artists make use of these elements often in a very simplified way. 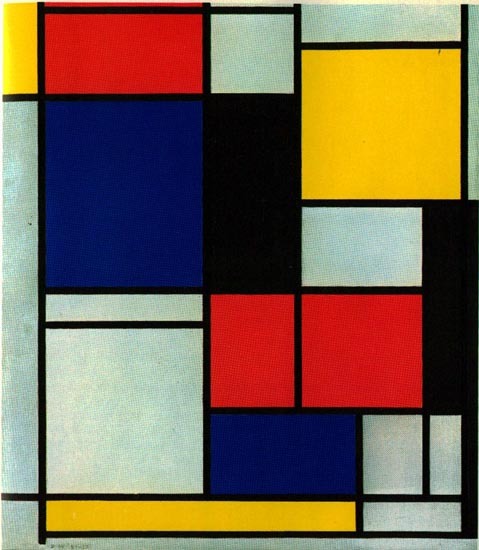 Mondrian reduced his paintings to the three primary colors (red, blue and yellow) and black, white and greys. He also systematically removed curved lines from his paintings, resulting in the colorful grids so well-known over the past century. His subject matter? Well, he was trying to find a universal set of visual terms that could be recognized and interpreted by all people, regardless of their cultural background. But you can also have degrees of abstraction. The Cubists, Picasso and Braque, abstracted their ideas by painting very ordinary things but representing multiple thoughts simultaneously, transparently super-imposed over one-another. They seemed to want to point out that the visual experience of something was never a simple, one-angled shot, but is made up of our ability to move in space, and have 3-dimensional vision as a result of the positioning of our eyes. So, although they may have painted a still-life, the purpose of these Cubist paintings was the idea of how we perceive space, form and our environment. There is a misconception that abstract art is about a kind of wild expressionism. But most abstract artists work with intellectual points of view, and employ as much thinking and technical skill in creating their images as the masters of the Renaissance did. 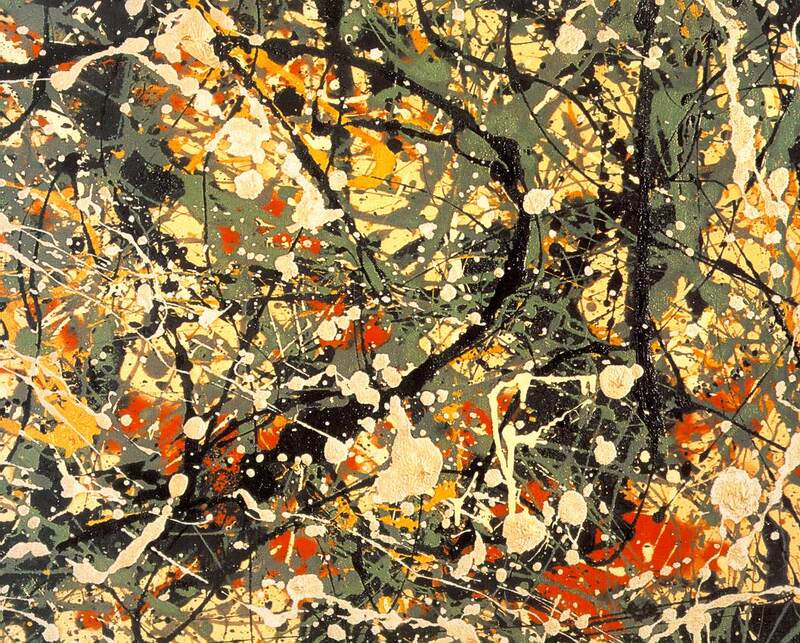 Even Jackson Pollock, whose paintings seem to be the aftermath of a frenzy of paint splashing, had a gentle, considered technique of applying carefully selected colors to his giant canvases to create depth, layers, interesting relationships, patterns and conflicting focal points. He created form through an excess of detail. At the other end of the scale is Henry Moore, who tried to capture the essence of human form by removing detail. A quick review of his drawings and early work will prove that he does not end up with such monumentally simple forms because he is unable to observe or reproduce the human form realistically. But he, like Mondrian, looks at what minimum amount of information is needed in the artwork in order for its intent to still be understood by a viewer. There is a stream of abstract artists who isolate meaning in their artworks through the use of symbols and puzzles. Miro, for example, was an artist who reduced his forms to flat shapes, often black enhanced with bright contrasting colors on neutral backgrounds. To the uninitiated they may seem childish and senseless, but to his fellow students of the Mystery Schools, they are treatises of deep meaning because esoteric symbols, numbers and characters are both represented and alluded to in his paintings. All the while, he is paying careful attention to composition, to retain value in the principles of balance in composition. Other abstract artists turn their attention to the artist’s materials themselves, looking in a focused way at how they can be used in new ways. Rothko painted large amorphous fields of color made up of many layers of transparent layers of color. And, doing so, he draws the attention of the viewer to the mood evoked, the textures arrived at, and the fact that to shapes conform very self-consciously to the edges of the canvas. He makes the point that art is never objective, always lives inside a context, and can allow the creative process to bring forth new discoveries. So, abstract art, far from being a primitive modality invented by people who can’t draw, is an intellectual art movement. Abstract artists shy away from reproducing pictures of reality (photography has that covered in this day and age) in favour of working with ideas. Abstract art tries to show us something new, tries to point out things we’ve missed in our common sense way of living.